So you’ve decided to make the move to a glass shower and now you want to know how to keep hard water stains and spots out? There seems to be a misconception that glass showers require higher maintenance than shower curtains, which often deters people from choosing a shower curtain over a glass shower, even then though they’re aware of the obvious health drawbacks from the shower curtains. In reality, maintaining glass showers do not require a lot of elbow grease, just little tlc to keep to your glass gleaming and clear, and when you think about it, the benefits outweigh the costs of living with mold and mildew cultivating in your shower curtain. Another option you may consider for the modern, sleek look of the glass shower without too much added maintenance is to the frameless glass shower. I’ve picked up quite a few tips from clients and experience over the years on how to keep your glass showers spick and span, and have compiled a list for you below. 1. I squee, you squee, we all squee…gee! Squeegeeing after each shower makes a significant impact on the clarity of your shower, eliminating spotted water droplets and the possibility of mildew growth. It only takes a few minutes of your time following your shower and is the easiest way to maintain a spot-free shower without using any added products. Keep your squeegee hanging in your shower stall with a suction cup hook for easy access, and the bonus is that you’re already in your shower, so you don’t have to make time to get in and do the work. 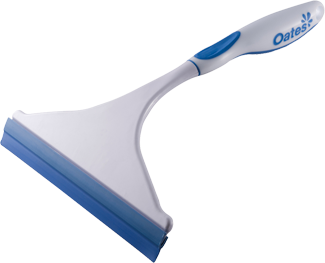 You can purchase an inexpensive squeegee from your local dollar store or home department store for a few dollars. I came across some branded squeegees on Apartment Therapy’s website if you’re concerned with ergonomic handling and design, but your run of the mill dollar store squeegee should be sufficient for the job. 2. Air Circulation. Ensuring your bathroom is well-ventilated will help prevent mildew and mould growth and requires virtually no effort on your part. You can keep the air circulating in the bathroom by keeping the fan on during and after your shower for about 30 minutes, opening a window, keeping your shower door open after your shower so air can filter in or plugging in a dehumidifier. Defensive Sprays. If you can’t be bothered to squeegee, you may be happy to hear that you can buy or make some sprays to decrease the deposits and repel the water. 3. Rain-X – I’ve heard a few people sing the praises of this product, which was made to improve the visibility of vehicle windows in extreme weather conditions involving rain, snow and sleet. The product wicks away the water with a water beading technology and keeps windows and glass streak free. 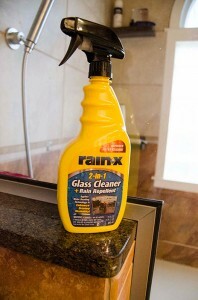 The website acknowledges Rain-X can be applied for home use on windows and glass showers, but warns to avoid using it on plastic shower doors and glass shower doors with etching or frosting, plexiglass and fiber glass. According to the website, the treatment will last approximately three months. 4. Daily Shower Spray – Branded daily shower sprays such as Tilex or Scrub Free have sprays specifically designed for preventing soap scum and hard water prevention. They are made for daily use, so you just spray it and forget it, but if you’re not keen on the potential harmful chemicals these sprays may have, take a look at the do-it-yourself option below. 5. 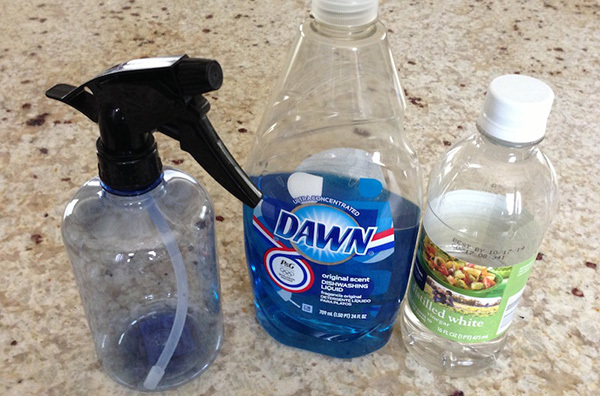 DIY Sprays – If you want a more economical option that doesn’t contain too many harsh chemicals. Here’s a simple recipe for a daily DIY Spray: 2 cups of vinegar, 2 cups of water and 2 tablespoons of a dishwashing agent such as Jet Dry. Store in a reusable spray bottle or purchase one from the dollar store to spray on after each shower. Use What You Already Have. Chances are you already have the cleaning solvents and tools you need to keep your glass shower gleaming. Many of the products we use in the laundry room and kitchen can be used to keep the bathroom sanitary as well. 6. 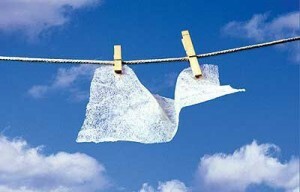 Dryer Sheet – One of my clients told me that she uses pre-used dryer sheets to wipe away soap residue on her shower doors. Simply dampening the used dryer sheet and using it as a cloth on the glass surfaces works amazingly well on surfaces that have accumulated build-up. If your residue build-up has been caked on for a while, you may want to use a scrubbing brush to break up the deposits on your glass, before wiping it with the dryer sheets. Dryer sheets are made to soften water deposits, which is what forms the build-up on your glass shower and draws the residue on to the fabric, much like how it absorbs static from clothing in the dryer. 7. Equal Parts Vinegar and Dawn – I’ve tried heating 1 cup of vinegar in the microwave, followed by mixing with 1 cup of dawn and emptying the contents into a spray bottle to use to clean the glass and it works beautifully. Spray, scrub and rinse with your shower head and you’re done. 8. Lemon Aid – Once you’ve cleaned your glass shower, cut a lemon in half, dip in baking soda (apparently sea salt works too) and rub over your glass door. This should help repel the oils and residue in the water from sticking to the glass. I hope you have the chance to test out some of these tips for yourself and do let me know how successful or unsuccessful they are. Do you have any great glass shower cleaning tips you’d like to share or want more information on the frameless glass shower? Leave me a comment below and let’s chat! Good post. I've had some good success using RainX on my shower and even mirrors so I'm glad to see it made it to the list! Your skills are superb man. I am highly inspired by the way you have shown up your thoughts in the blog. It is hard to see such kind of knowledgeable information on such small topics that too on blogs. Thanks a ton buddy. Thank you! Glad this blog helped! Thanks for elaborating on the different ways you can keep your glass show clean. I agree that it's important to do the little daily things to help keep your shower clean. My mom has been looking into getting a glass shower installed and she has been wondering what the upkeep will be; I will be sure to share this with her. 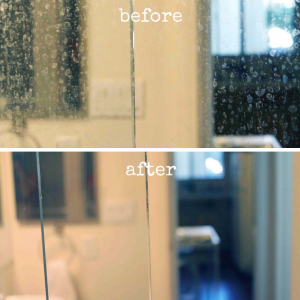 I really appreciate your tip to use a scrubbing brush if there is a lot of grime caked up on your shower door. My wife and I have been thinking of getting a new bathroom remodel, and we want to take good care of our shower door when it comes in. If any grime gets caked on, I will be sure to use a scrubbing brush! You do make a good point about cleaning after one uses the shower to avoid getting watermarks and mildew on the shower head, tiles, and glass. However, your suggestion about opting for a frameless glass shower to reduce the amount of bathroom maintenance reminds me to update all our showers at our home. I will look for a contractor who can install one for us in the coming weeks so that all our house bathrooms fit with the rest of the house and that we can have more time for family bonding from the time saved on having less maintenance on our future remodeled bathrooms.